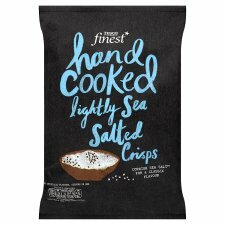 As these Crisps were particularly hardened by the oil they were cooked in, the crunch was sustained for a lot longer than most regular Crisps. The bite was firm, the crunch was hard and the chomp continued right to the end of the Crisp’s sad and painful life. The Crisps looked like hardened yellow oil. There were oil boils, but the Crisps were as flat as hot fried thin slices of potato could be. There was no visible seasoning, but there was some skin on edges. A Nose Plunge Test revealed an odd aroma of empty bag. We had to double take to make sure there were some Crisps in there. The taste was a little more rewarding, but only a little. The flavour was exactly as described, Lightly Salted. The over-riding flavour however was oil. Potatoey oil.